Seattle Chamber Music Society’s 2017 Summer Festival to feature musical postcards from across Europe, an American composer’s world premiere and a community performance of Bach before the closing open-air concert at Volunteer Park. “Sometimes the idea for an entire festival will sprout out of one little seed,” says James Ehnes, the internationally renowned violinist and artistic director of the Seattle Chamber Music Society. Now in its 36th season, SCMS launches the 2017 edition of its Summer Festival on July 3. It includes a total of 12 different concert programs at the Illsley Ball Nordstrom Recital Hall — three each week — plus such free events as the closing open-air concert on July 29 at Volunteer Park. Among the 46 musicians on this summer’s roster are such illustrious figures as Noah Bendix-Balgley (first concertmaster of the Berlin Philharmonic); cellist Astrid Schween, newest member of the Juilliard Quartet; and Tchaikovsky Piano Competition silver medalist George Li. 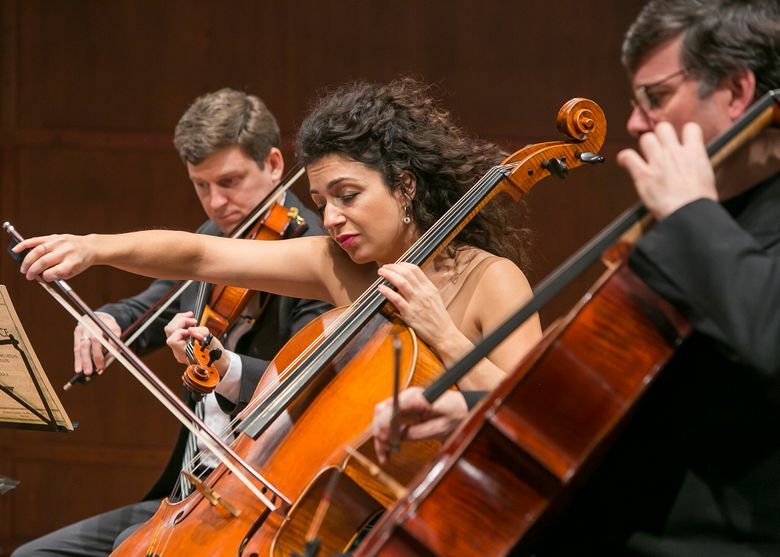 July 3-29, with concerts at 8 p.m. each Monday, Wednesday, and Friday at Benaroya Hall, Seattle (free prelude recitals at 7 p.m.); $16-$52 (seattlechambermusic.org). • “The Emperor’s New Clothes,” a 40-minute family concert, is at 11 a.m. Saturday, July 22, at Benaroya Hall; $12. • The free outdoor concert at Volunteer Park is at 7 p.m. Saturday, July 29. The idea expanded into a musical itinerary across Europe, with one of each week’s three programs devoted to composers from an area known for its rich musical heritage: in addition to France on July 14, the destinations will be Russia (July 5), Bohemia (July 21) and Vienna (July 28). The festival also brings a world premiere (on July 10): “Fictional Migrations,” a trio for flute, horn and piano by the American composer Lisa Bielawa. Her new work combines inspirations from “the spirit of speculative fiction,” the Greek myth of Alcyone and the French composer Olivier Messiaen (to whose memory it is dedicated). Bielawa’s piece points to another notable trend in Ehnes’ programming this summer: the proportion of chamber works whose scoring includes winds. Some other examples are Stravinsky’s “L’histoire du Soldat Suite” (July 3), Samuel Barber’s “Summer Music” (July 12), and Saint-Saëns’ “Carnival of the Animals” (July 14). “I’ve been joking that it’s like we’ve cornered the market on the world’s greatest clarinet players,” Ehnes says, mentioning Anthony McGill and Ricardo Morales (principal clarinet of the New York Philharmonic and Philadelphia Orchestra, respectively) and the Seattle-based Sean Osborn. “The notion that chamber music is only about strings and piano is so limiting. One of the funnest pieces to play and listen to is Beethoven’s Septet in E-flat for Strings and Winds.” An early work that scored Beethoven one of his biggest successes, the Septet will be featured in the free Volunteer Park concert. That program is just one of the seven (plus a recital) in which Ehnes himself will perform. Recently named Instrumentalist of the Year by London’s Royal Philharmonic Society, the violinist points to two 20th-century landmarks he’ll be playing with colleagues as special favorites: Olivier Messiaen’s “Quartet for the End of Time” (July 24) and Arnold Schoenberg’s “Transfigured Night” (part of the “Vienna” program on July 28). The Schoenberg sextet, an early work in a lush, late-Romantic vein, was written in the same decade as Brahms’s Op. 114 Clarinet Trio, which shares the program. “I’m always thinking about presenting music in different contexts so people can appreciate a piece not just for what it is but for how it fits with other things,” says Ehnes. Thomas May writes about the arts for a wide variety of publications. His books include “Decoding Wagner” and “The John Adams Reader” and he blogs at www.memeteria.com. On Twitter @memeteria.